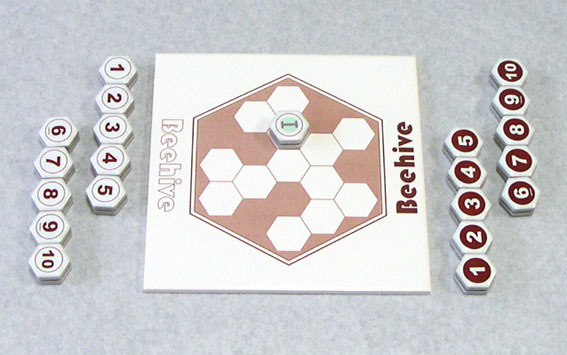 "Beehive" is a number puzzle game to place number tiles on the board. Players have 10 pieces (from 1 to 10) each other and there is more one starting piece numbered 1. Player takes turn each other. He places any one of his pieces on the board at turn. There are 19 spaces on the board, so players place pieces completely 1 piece remains each other. Who remains bigger number tile is winner. If number is even, first player wins. When any player can't place own piece at his turn, he is looser. more information in japanese about Beehive. click here! Object: To place own number tiles on the board and remain bigger number tile. 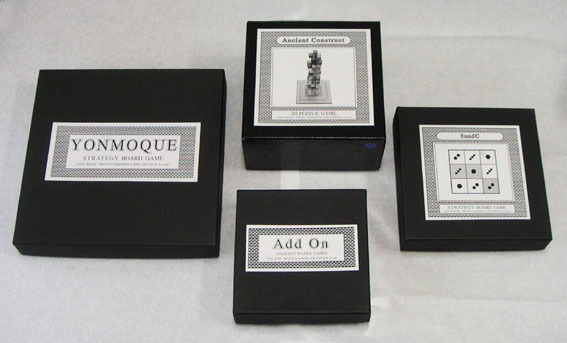 Players have 10 own pieces (from 1 to 10). An additional starting tile is 1. No pieces on the board. Players place any one of own pieces on the board by turn. At initial turn first player must place starting tile on any space except center on the board. Next player places one own piece on the board according to placing rule. He must place it touching to other piece(s) on the board. If touching piece is one, he can place any bigger number piece which is same even or odd. If touching pieces are more than two, calculate sum of touching piece's number. The first figure of sum number is the piece can be placed. Figure 0 is 10.
Who remains bigger number tile is winner. If number is even, first player wins. When any player can't place own piece at his turn, he is looser.